El cineasta Massimo Natale, el director de cine y productor Gianpiero Fontana y las actrices Daría Botte y Silvia Delfino protagonizan la historia del restaurante La Bothéca. 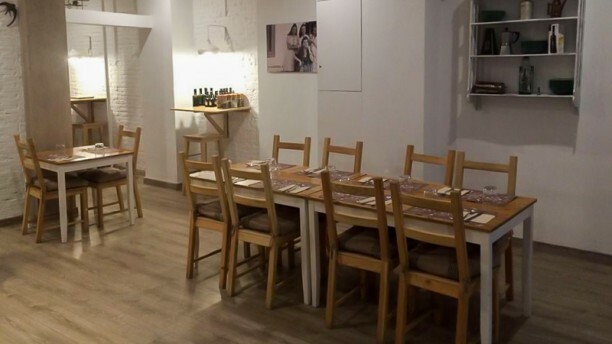 Un restaurante de cocina italiana con base de producto valenciano fresco y de calidad que encuentras junto al cauce del Turia. Una agradable sorpresa en Valencia. Un restaurante para repetir. Real cucina napoletana, great atmosphere. Had a lovely time, highly reccomend. Great restaurant, amazing gluten free menu, lovely wine selection. Staff were amazing, chef even came out and spoke to us to see if we enjoyed our meal. The menu was total organic and everything was really fresh. Would definitely eat here again. Is the third time I go to La Botheca, and it has never disappointed. The food is incredible, so delicious, is real Italian food, and practically all the items on the menu are gluten-free. The mozzarella is spectacular, the lasagne is to die for, and the same with all the rest! Special note to desserts, leave space for them because they are worth it! Gluten-free tiramisu is words of heaven for a celiac, but as a chef, believe me if I tell you it is one of the best tiramisu I have ever eaten. I am so happy a place like this has opened in Valencia, I hope it lasts forever! Staff and owners are really nice too and service is excellent. Great food and really good value. If you want quality not quantity then this is the place for you. The best Italian food we tried in the area. Faultless. Great food, excellent price for the quality and attentive waiters. Excellent italien, les desserts sont au top. I loved this place! Food so fresh and gluten free! Lovely service and would love to go back! Def recommend this place!! Great food, great people, great location!! Excellent "farm to table" Italian restaurant. Salad and main course were both very fresh and tasty. Enjoyed a. bottle of organic red wine too. Staff and owner (Jean Pierre) were friendly and accommodating. Highly recommend for a very enjoyable dining experience. We had an excellent Italian lunch. The Italian owners are very sweet and the food they are serving is very fresh and rich of flavour. One of our friends has a gluten allergia and she had a wide range to choose from in the menue. So special. Love to go back there. Fuimos mi pareja y yo a cenar y salimos muy contentos. La mozzarella (casera y hecha por ellos mismos) estaba riquísima, y la carta no es lo mismo que se puede encontrar en otros restaurantes italianos. El trato que recibimos fue estupendo y muy amable, y el precio es ajustado (incluso sin tener en cuenta el cupón con el que acudimos). Repetiremos. Superior products, skillfully prepared, deliciously finished and served with love and passion! A must do when in Valencia!